Today is the first in a little series of mine all about COLOUR. 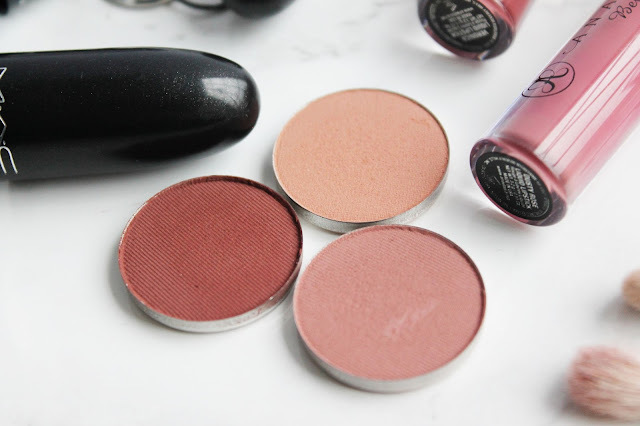 Each month, I want to choose a colour that I've been loving and that I feel is relevant to the season to chat to you about; I'll show you my favourite picks from that colour collection and give you my opinion on them! Hopefully, I can get suggestions from you guys on what colours you might like to see too. This months pick - Dusty Rose. This is a colour that has not strayed from my makeup collection for as long as I remember, it is the perfect transition from summer to autumn, and can carry us through into winter too. This deep, mauve toned pink colour scheme has become so popular in the beauty world, with various brands putting their own spin on it, and I personally can't wait to see what products we have in store for A/W. 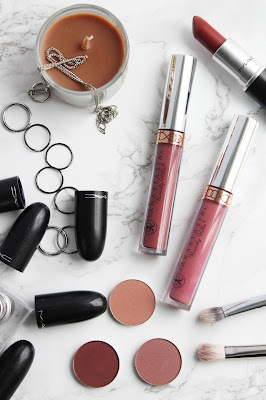 So this month I have picked 6 of my personal favourite 'Dusty Rose' makeup items, 5 from Anastasia Beverly Hills (I'm obsessed!!!) and 1 from MAC cosmetics. 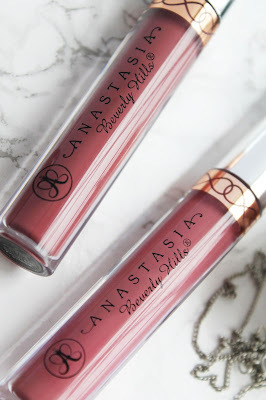 Anastasia Beverly Hills 'Dusty Rose' Liquid Lipstick | The name of this product definitely speaks for itself as to why it's in my collection for this month; dusty rose is the perfect mauve pink for the winter months. It's a pink tone primarily, with a deep berry flushed through it to create the perfect autumnal lip colour, with staying power like no other - this is a personal favourite of mine! Anastasia Beverly Hills 'Veronica' Liquid Lipstick | In the photos above, these two liquid lipsticks look extremely similar, however, veronica is a much deeper shade with purple undertones. It dries down to a perfectly deep matte shade and is definitely A/W appropriate, this too is a staple in my collection and goes perfectly with any eye look. MAC 'Whirl' lipstick | Whirl, the original Kylie Jenner lip shade that has been oh so saught after by just about every beauty guru/enthusiast in the world! I was so extatic when I found out that whirl lip liner was being made into a lipstick, and I just had to get my hands on it. Whirl is the perfect matte lip for any occasion, it's completely shine free, but incredibly easy to apply and not drying on the lips whatsoever. Anastasia Beverly Hills Eyeshdows 'Birkin, Dusty Rose, Red Earth' | I couldn't write a post dedicated to dusty rose without including my favourite eyeshadow combination, pretty much, EVER could I? These three eyeshadows work together perfectly to create THE best neutral eye look in about 3 minutes maximum. A blending brush here, a blending brush there and voi la, you have yourself an autumnal eye ready for any occasion. The pigment and blendability really is out of this world. 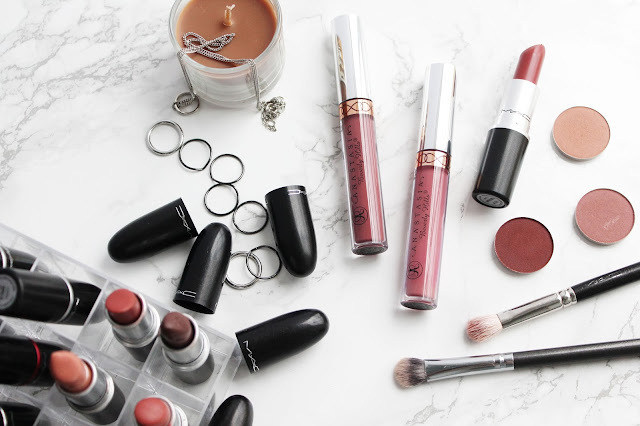 Do you have any dusty rose favourites? Great post! Dusty Rose is a gorgeous colour, I love that Mac lipstick, I didn't realise 'Whirl' was being made into a lipstick, I think I'll add it to my Christmas list. It really is so lovely! The whirl formula is perfect too. Definitely invest! Where do you get your makeup brushes from?